It’s no coincidence that Shanghai has been known as the “gateway to China” long before IMS arrived in the city. Thanks to the city’s proximity to the water, Shanghai has always been a trade and economic centre for the country and is a pretty intoxicating blend of the historic colonial Bund and the skyscraping towers of the modern day. Beyond the usual tourist haunts of food and site-seeing, Shanghai has an extravagant atmosphere as one of the largest and richest cities in China – which means shopping and experiences often compared to the likes of New York City or Paris. OF course, IMS wouldn’t be posting itself there, unless Shanghai had a very promising nightlife culture with mega clubs and bars like Bar Rouge or minimal, for-the-music-only venues like The Shelter. Shanghai is also a convenient jump-off point for travel throughout the rest of China or Asia, so IMS might be just the springboard of your trip. Hyatt on the Bund Hotel Shanghai is a 5 star luxury hotel, uniquely located on the banks of the Huang Pu River at the northern end of the Bund in Shanghai, China. Hotel suites and rooms at this luxury Shanghai hotel offers spectacular views of the Bund and Pudong, with convenient access to Shanghai’s airports and major areas of the city. A member of the Grand Hyatt portfolio, Hyatt on the Bund Hotel Shanghai offers guests a unique experience with stylish Shanghai restaurants, sophisticated comfort, and functional conference rooms equipped with advanced technological equipment. Hyatt on the Bund Hotel Shanghai is also host to the Yuan Spa, Shanghai which offers a variety of massage and facial treatments. Enjoy contemporary, simple style in a 42-45-sq-metre room featuring one king bed, work desk, LCD flat-screen TV, plus marble bath with rain shower and soaking tub. Enjoy high-speed Internet, plus views of the Huang Pu River, Pudong skyscrapers or the Bund’s colonial buildings. 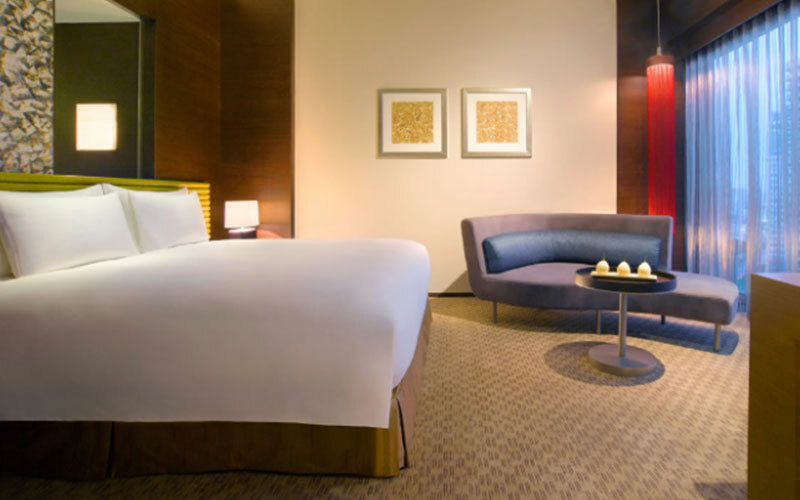 Spacious 80-sq-metre suite features every modern comfort and amenity, including a king bed and sitting area, work desk and rotating flat-screen LCD TV, plus marble bath with rain shower and soaking tub. Enjoy a balcony with city views and executive floor benefits such as breakfast, cocktails and meeting room upon request. Welcome to choose Hyatt on the Bund for room reservation. Enjoy panoramic views of the Huang Pu River or the Bund’s colonial buildings from a 42-45-sq-metre river view hotel room, located on the upper floors of the hotel. Modern comforts include a king bed, work desk, flat-screen LCD TV, DVD player and spacious bath with deep soaking tub and rain shower. A simple, contemporary design complements the latest in technology, including high-speed Internet access.